Yeah, she’s gorgeous isn’t she? Christa Watson opened up a chance to make a quilt in her new book, Piece and Quilt with Precuts and I jumped at the chance. I chose to make Spools as a challenge to myself. 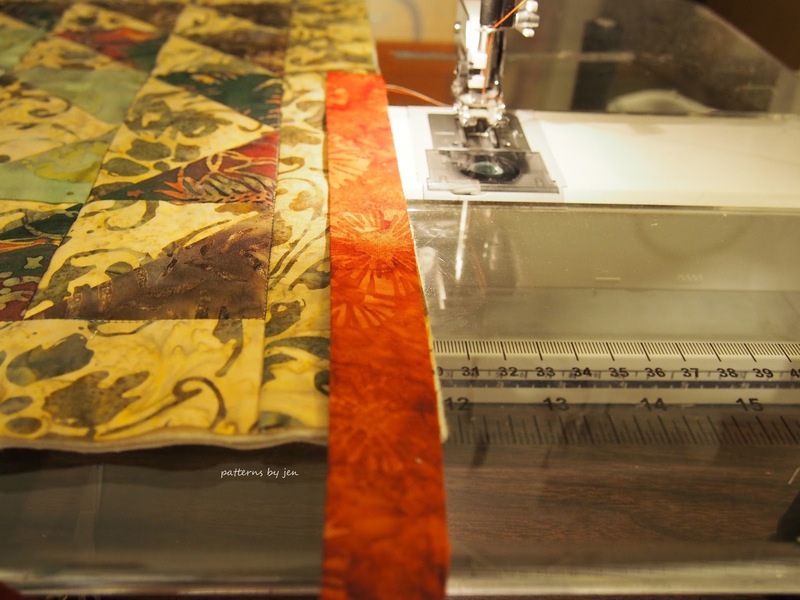 I am very much a straight and narrow type of person/quilter. 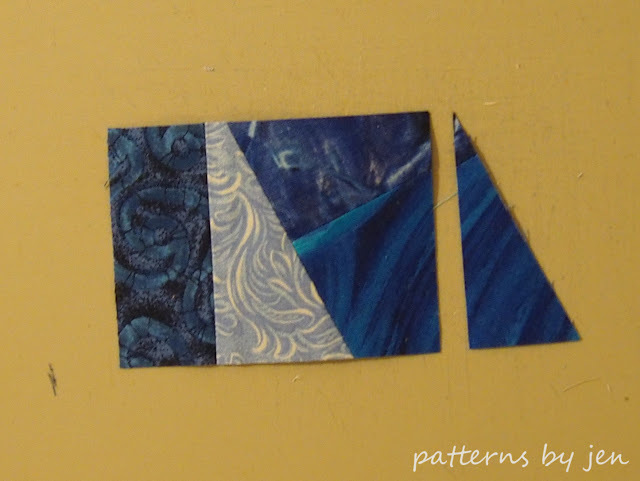 To do any kind of improvisational piecing takes me way out of my comfort zone, but sometimes that’s a good thing. 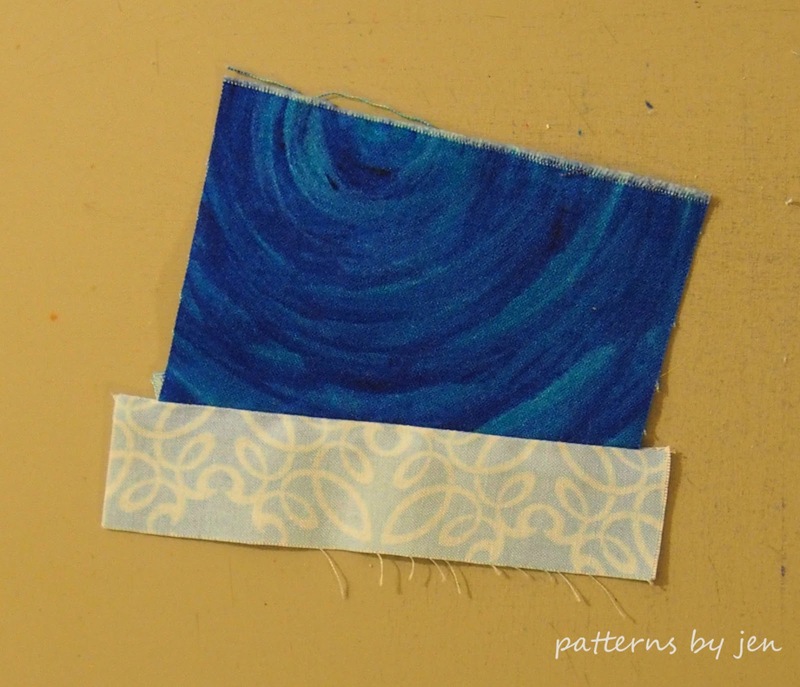 So how does a perfectionist at heart embrace improv piecing without hiding in the corner and crying? I would love to show you how! 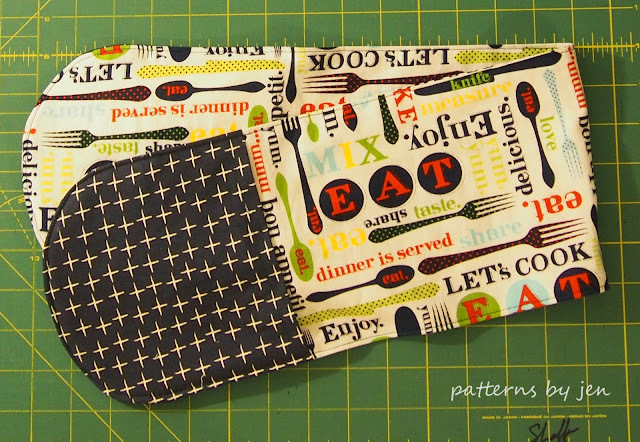 Christa has her patterns precut and/or scrap friendly (hence the name) however I rarely buy precuts and I’m not a big scrap person. 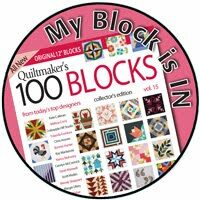 I know, I know, I broke two of the biggest quilting loves. What can I say…it’s just the way I am. I chose to make my own scraps however, because I felt that would give me the most success with the improv piecing. To do this I gathered the colors I would be using (following Christa’s choices, because lets face it, I was already in over my traditional, straight-lined, black and white little head) and began cutting. Here is where you take a breath and let go, but don’t close your eyes. Cutting with your eyes closed is a bad idea. 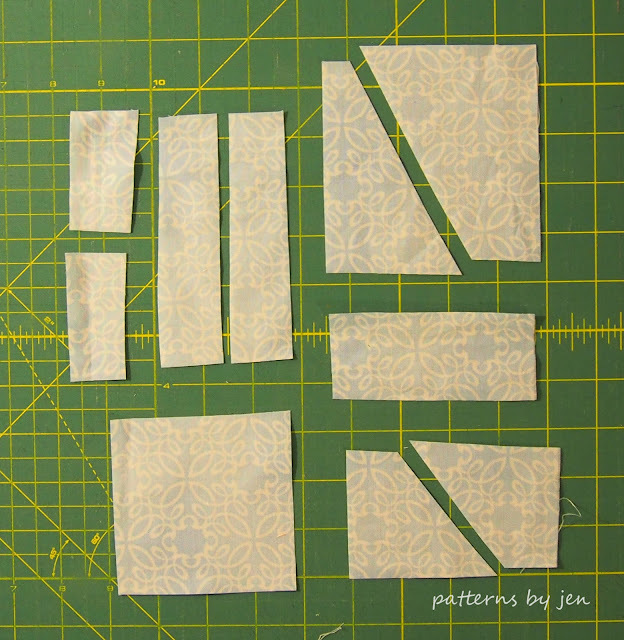 I cut into strips, then rectangles, squares and triangles. 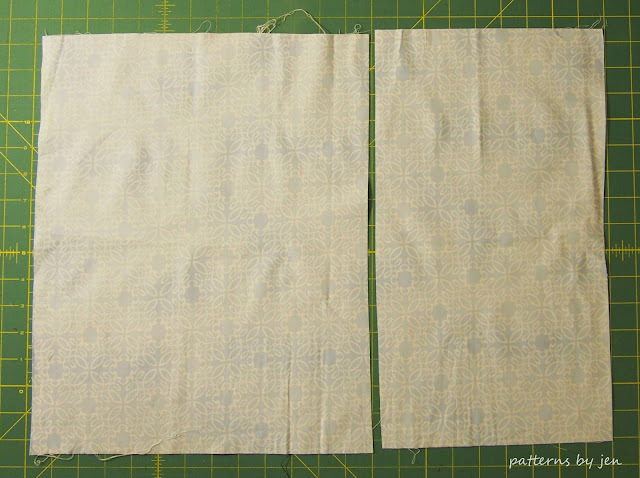 Don’t worry about the size, though you don’t want to cut less than 3/4” wide, because of the seam allowance. 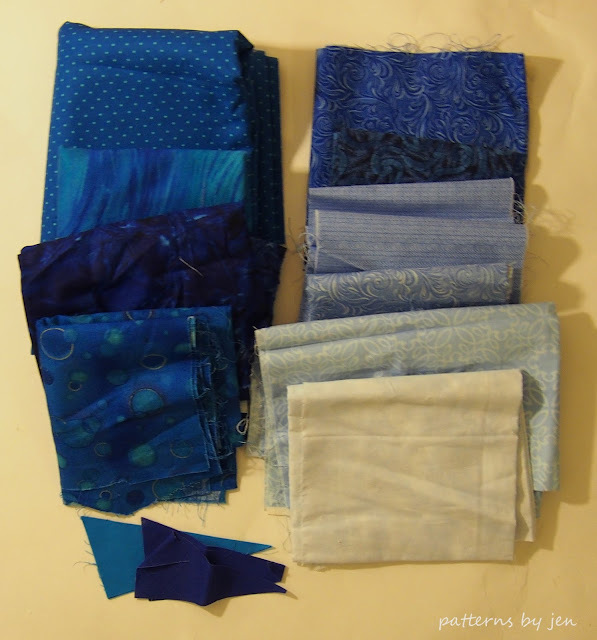 I didn’t really count how many pieces I cut from each fabric, I just made a sure I had a variety of sizes from each one and a good pile, because once you start sewing and trimming the pieces seam to shrink. It’s weird. So make sure you start with a bunch. After the first seam, I start trimming for straight edges. This made my perfectionistic heart much happier. Using the seam as my straight edge I trimmed each side. I loved making the pieces with angles. Trimmed nicely I've got a piece with a little "extra." 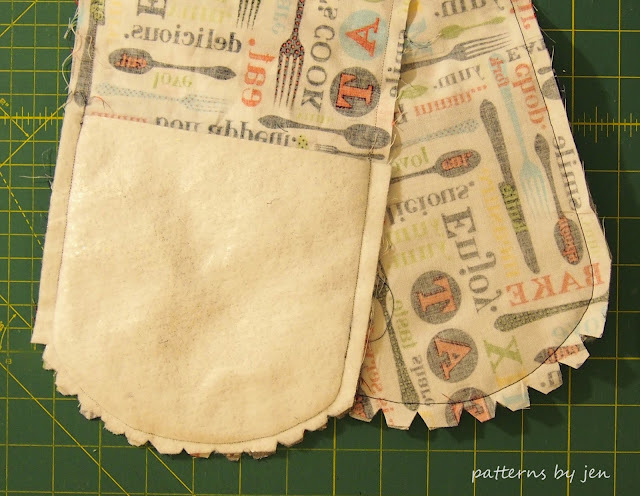 As you go along and the seams build up, you can still use your regular foot to piece. When it's time to put blocks together, I put a pin on either side of the seams to make sure my corners came together nicely. I would suggest making each block separately. I ended up making all of the background pieces at one time, and while I still enjoyed the process, working with white on white on white forever and ever wasn’t as fun as adding that color. Plus, it’s fun to see the progress. 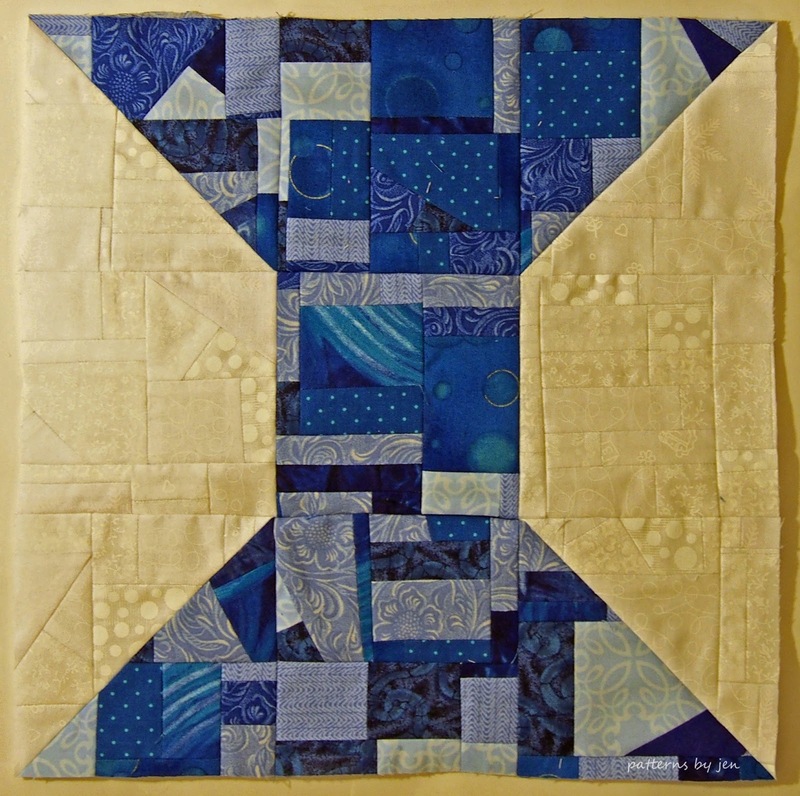 I made the blue spool block to share a picture with Christa, and it definitely revitalized my excitement in the quilt. 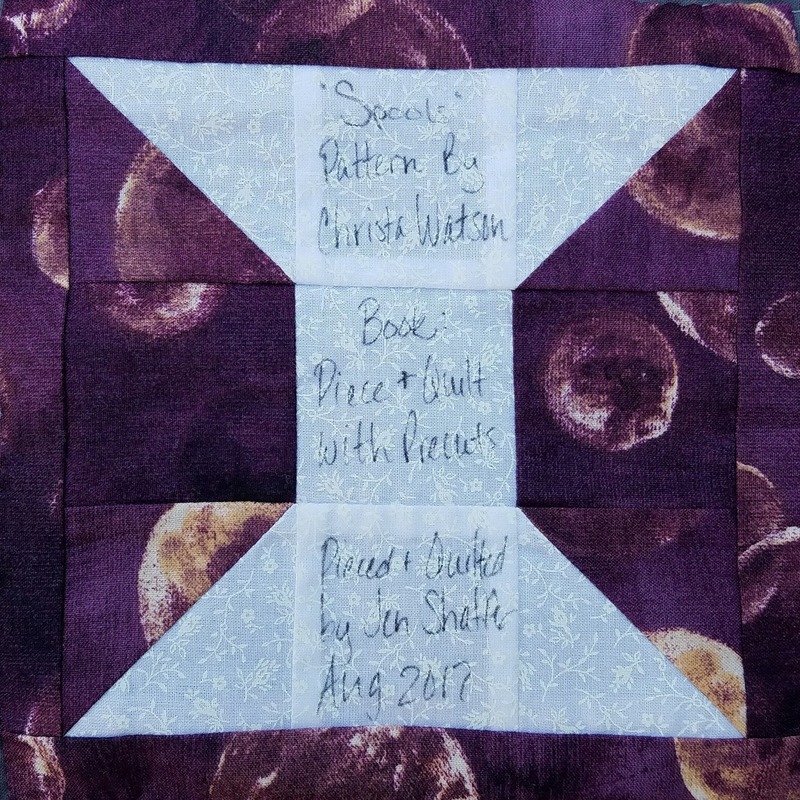 I used two quilting patterns in Christa’s book to quilt the Spools quilt, neither of the ones she used, because frankly there wasn’t time and there was no patience within me. Patience is important when free motion quilting. In the background of the blocks I used her Arrowhead Design, or rather a variation of it. That time constraint things really wreaked havoc with my plans, but such is life. In the sashing I used the Quilting Modern Zig Zags quilting pattern. I left the spools open. 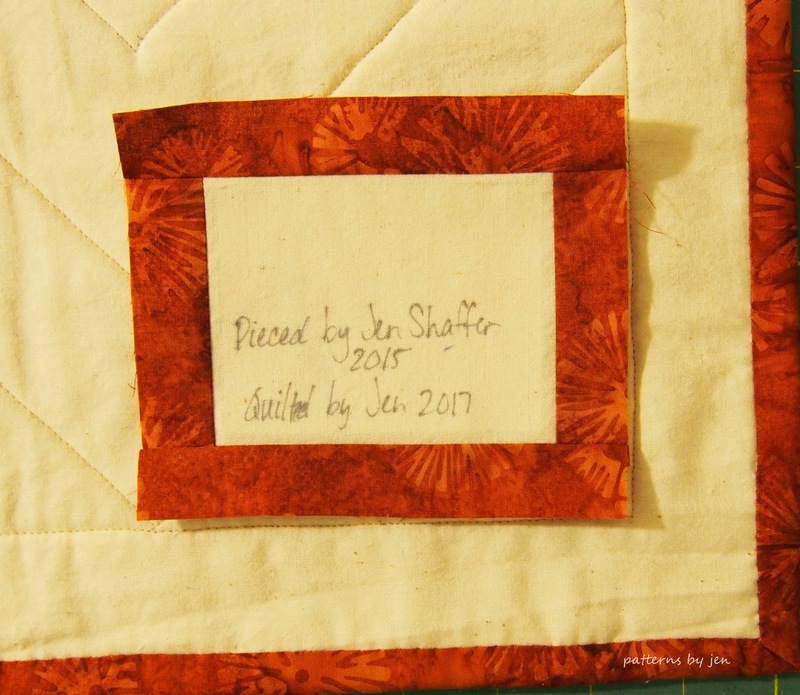 Confession: I’m a lazy quilter. 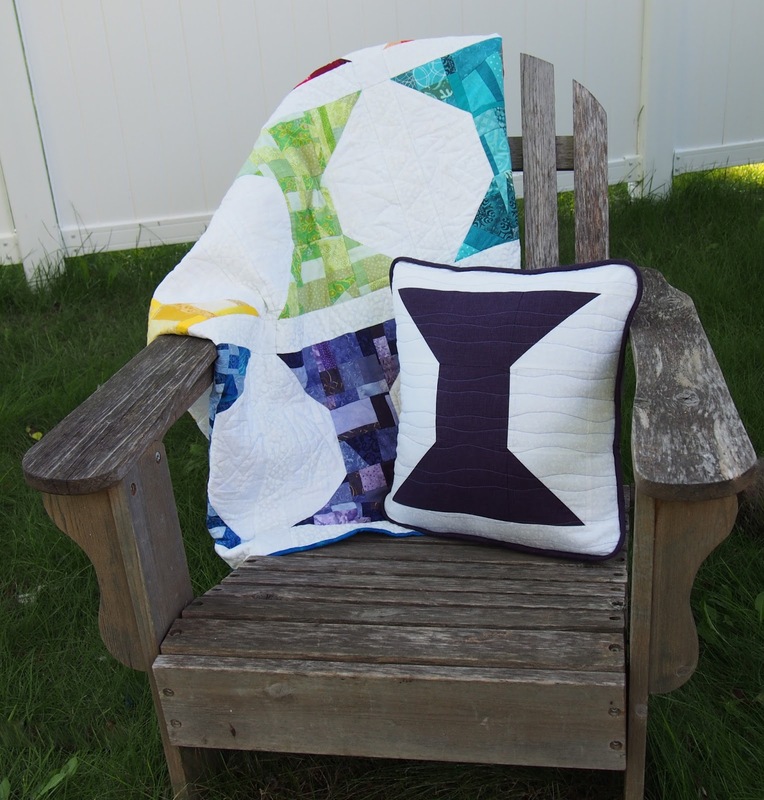 If it doesn’t NEED to be quilted, I don’t quilt it. Shhhhhh…. I bound in a scrappy fashion that started out awesome and then I realized as I started on the pink that I hadn’t calculated the binding correctly. Pink was the 3rd color in the binding strip, so I could have ripped, but that’s just silly and scrappy is scrappy right? Don’t tell the perfectionist half that the lazy half won. Then I had this awesome idea to make a spool for the label. White, because it’s empty, because the quilt is done. Get it? Yep, awww-some!! Yep, I'm a little corny. Have you ever had an idea that you had to just make? I kept thinking about this quilt and those who might be like me and a little reluctant to step out of the tried and true. 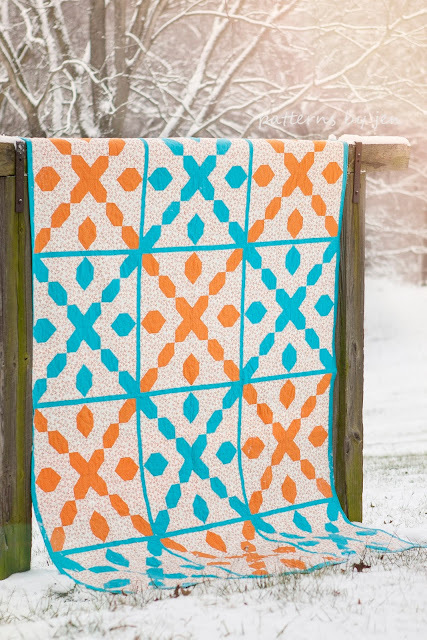 Would this quilt look just as awesome if it was made with tradition pieces, not improv? 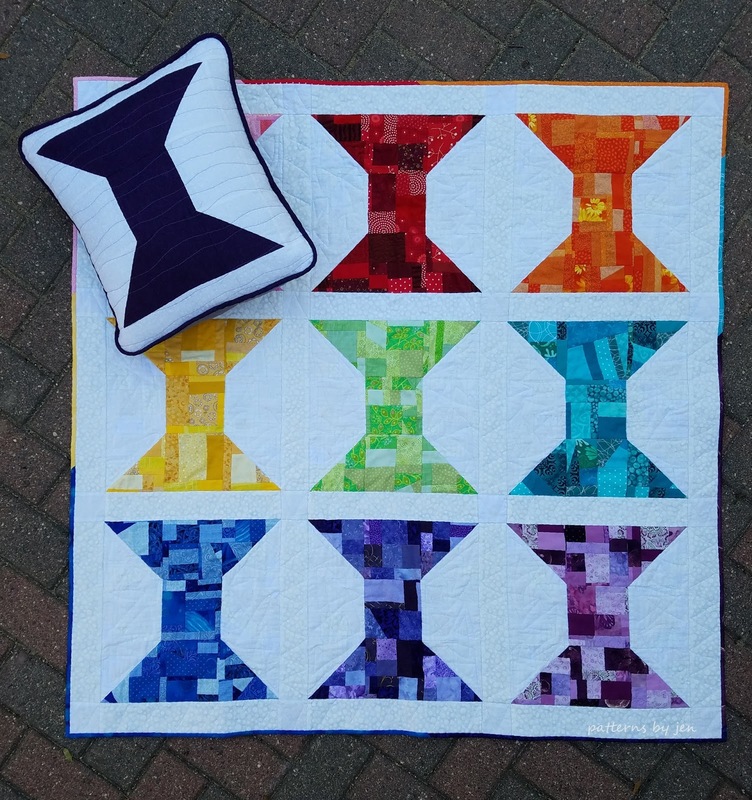 I knew there was no way I could get another quilt made, as easily as this went together, but I was dying to try a simplified block. Spool pillow anyone? I think every sewing room should have one. I. Love. This. Pillow. I took one block, used fusible fleece on the back and quilted just a little bit using squiggle lines quilting pattern from Christa’s book. I couldn’t picture it without piping, so that happened, too. Ready to make your Spools quilt? You could win a digital copy of Piece and Quilt with Precuts just by leaving a comment. Comments open until midnight, August 31st CST. Need a comment idea? What color will you make your Spool pillow? 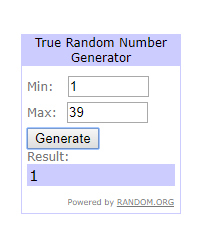 Giveaway is closed! Congratulations Hyde!! If you want a hold in your hand book, pick yours up from Christa HERE and she will autograph it for you. It is well worth it! 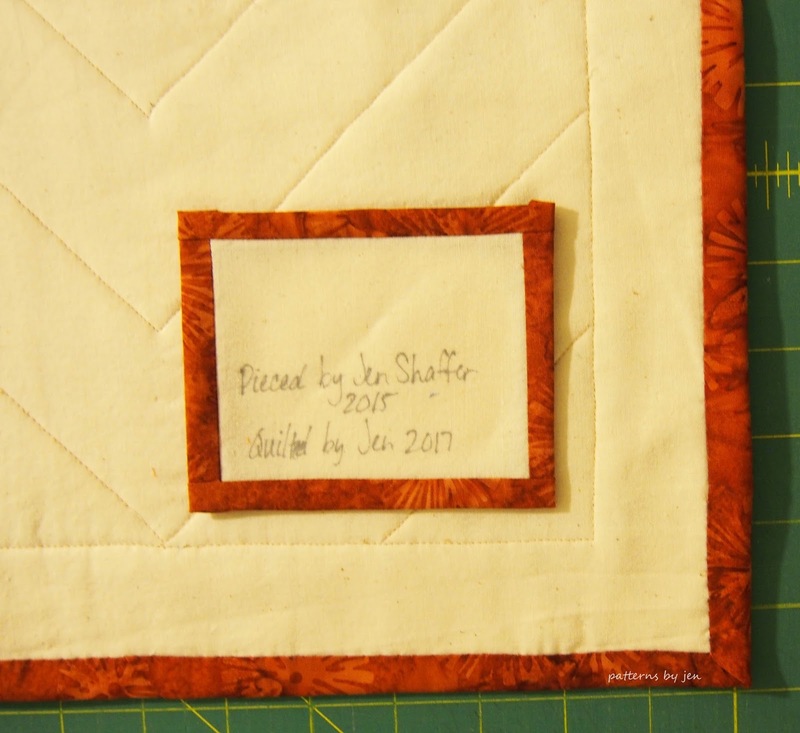 The instructions are easy to follow, and you get multiple quilting designs that mix match for all the quilts. 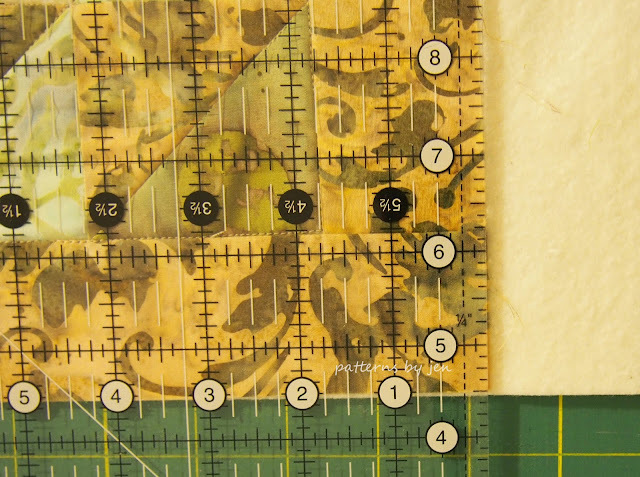 I’m so glad you stopped by on the Piece and Quilt with Precuts Blog Hop! Please stick around and check out some of the happenings going on here at PBJ. 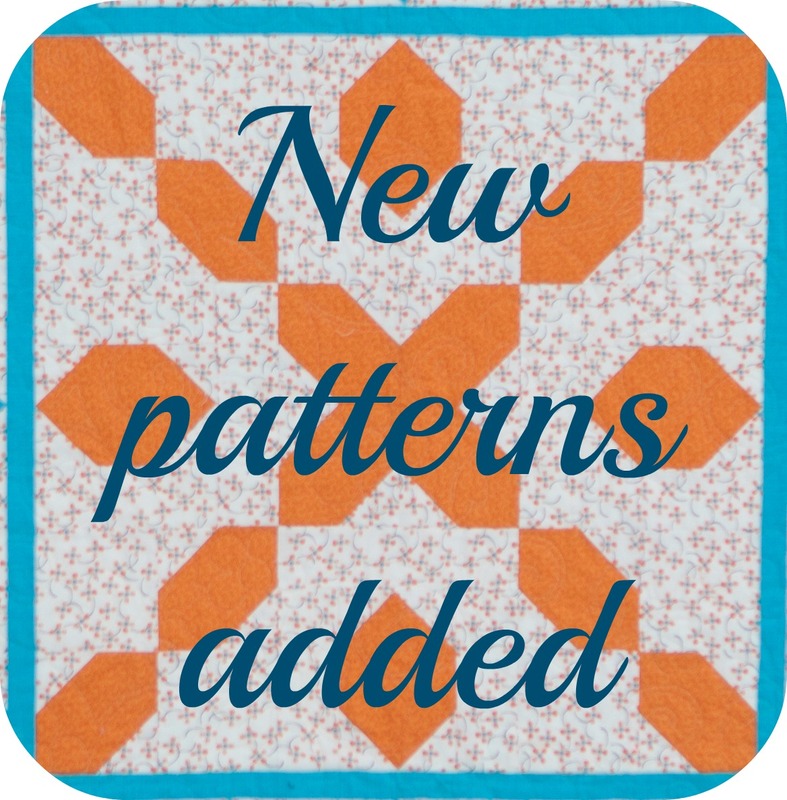 There is a Beginners Unite Quilt Along starting September 5th and on the 1st of every month there is a new mug rug pattern released as part of the Muggamo series. Follow me on Instagram and Facebook for daily updates and sneak peeks. 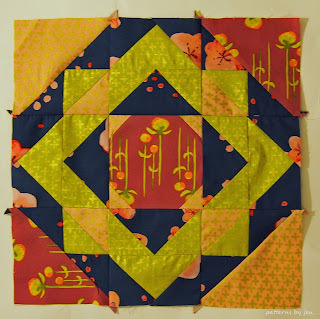 After you’ve had a look around check out the earlier stops on the blog hop. 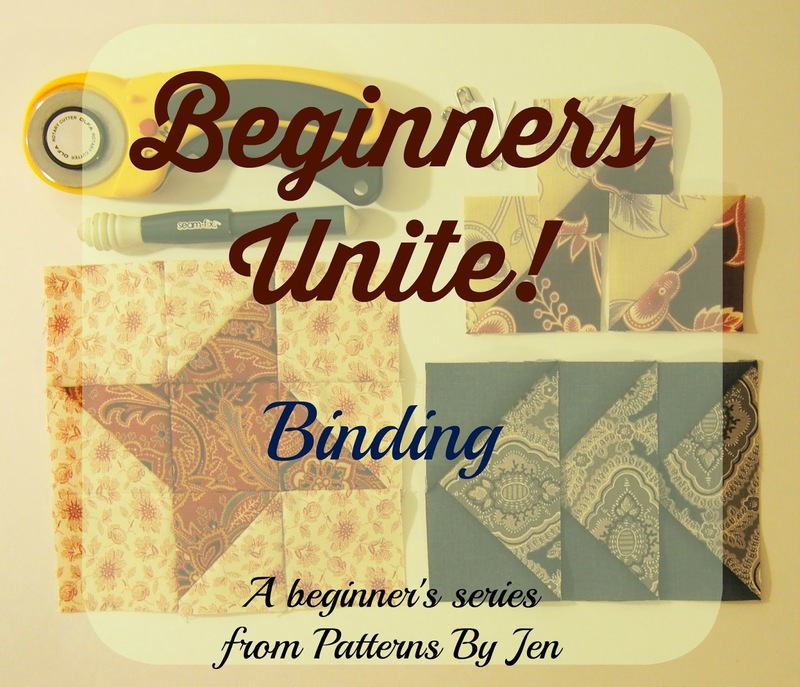 The Beginners Unite Quilt Along is almost here! This first post is just going to talk about fabric requirements and "the plan." You can download the free lap sized quilt pattern HERE. 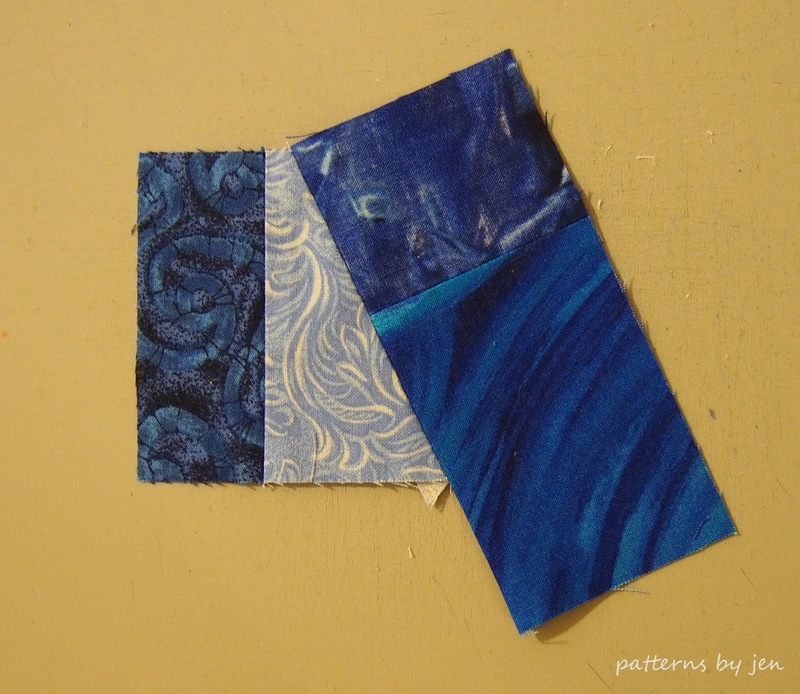 I will be making my quilt using the Haiku 2 fabric line from Monaluna. The Quilt Along starts September 5 and will continue every Tuesday through October 31. This will take us from the first cut to the quilting. 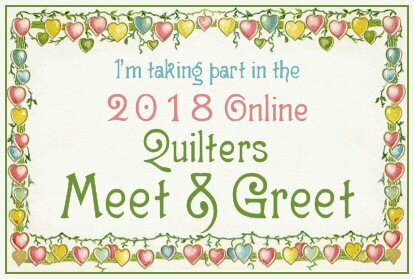 I hope you will join us in this fun quilt along! To receive email notices sign up HERE. This is a new set up for me, so please be patient as I work out any bugs that may come along. 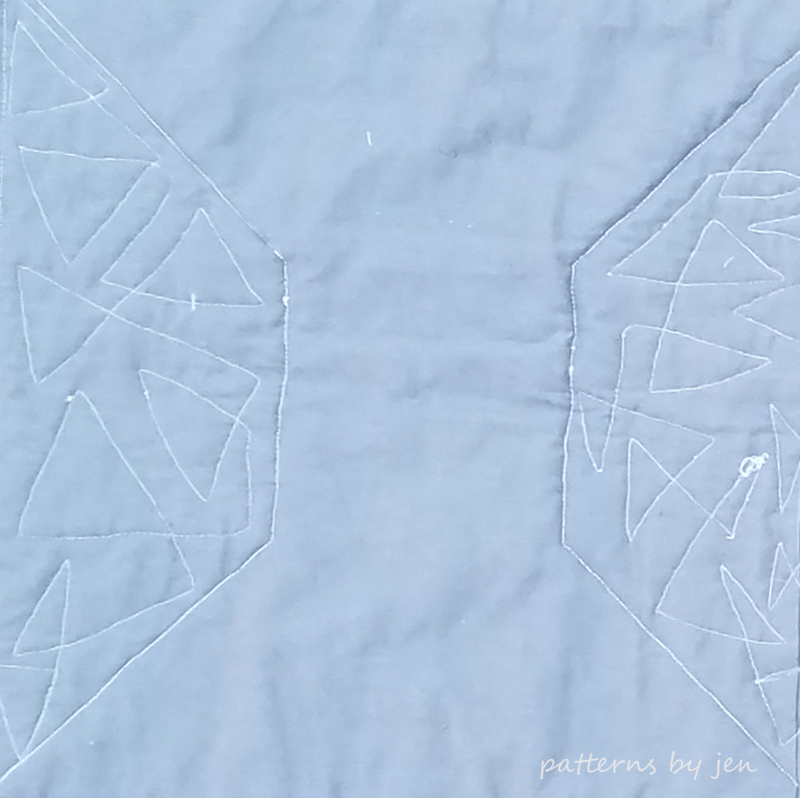 I've just started a new Facebook group called Quilt and Learn with Patterns By Jen. I would love to have you join. We can share our progress pictures and get questions answered fast. This Picked By Jen is from Hey Lets Make Stuff. You can find the pattern and tutorial here: The Easy-Sew Two-Handed Casserole Pot Holder. 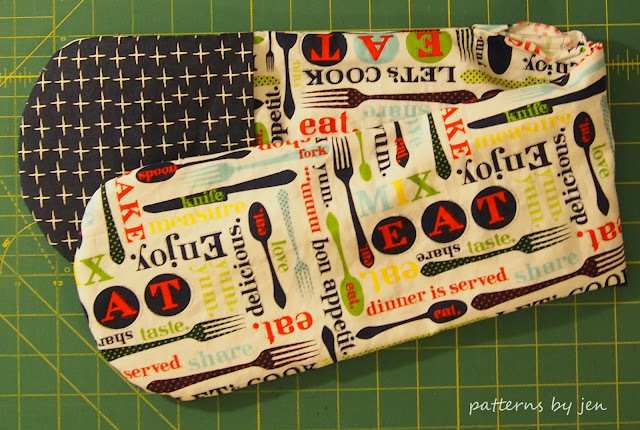 This really is a quick and easy sew and makes a great gift. 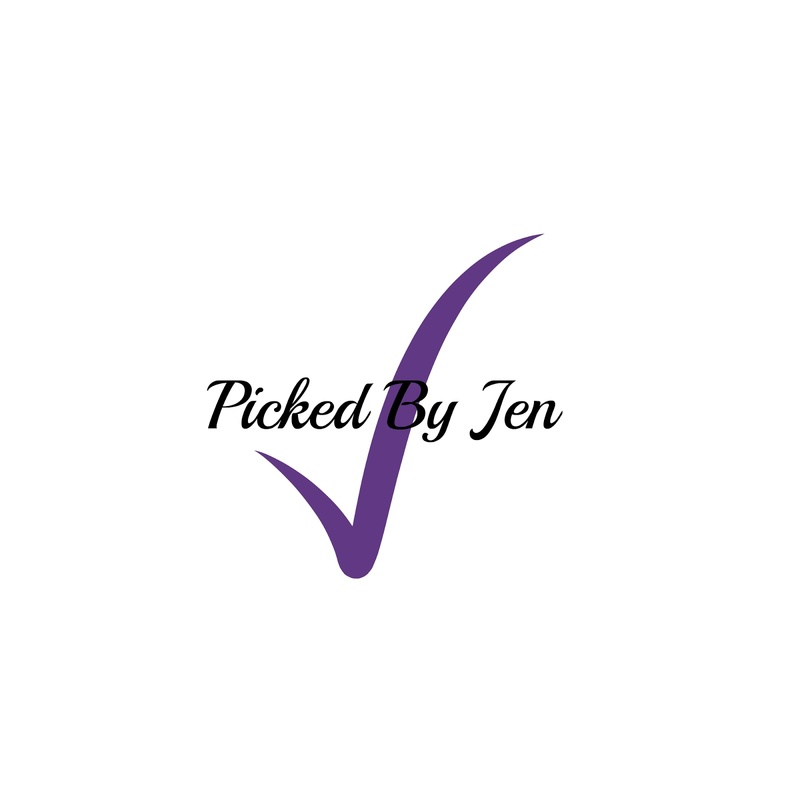 In fact this Picked By Jen came about because my husband requested some like his mom's. Since his birthday was yesterday I thought it would be the perfect time to whip it up. The instructions are easy to follow, but definitely take the time to cut slowly. I was in a hurry and my cuts weren't exactly equal. 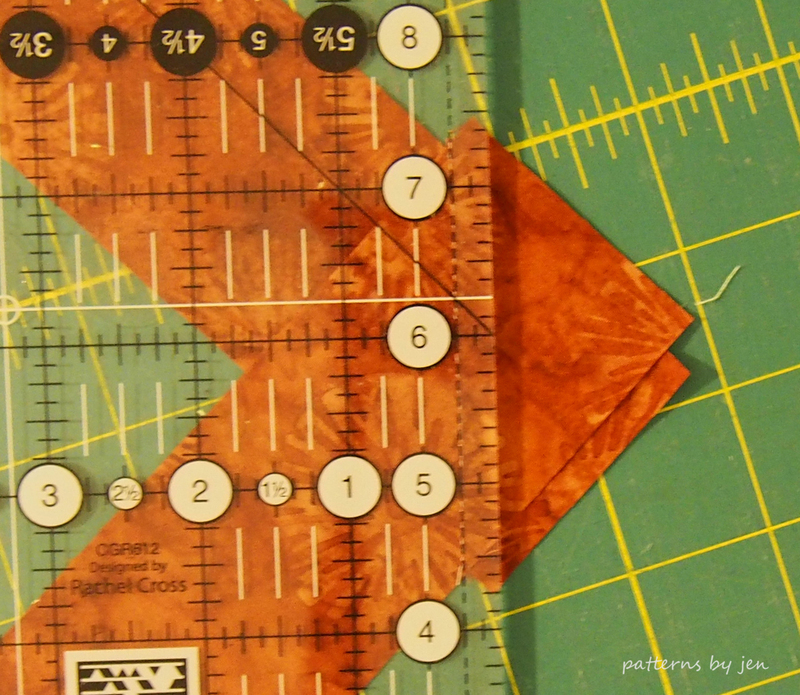 I made my seam allowance larger to accommodate. Looking at this picture I think it's time I finally bite the bullet and get a pair of pinking shears. What do you think? 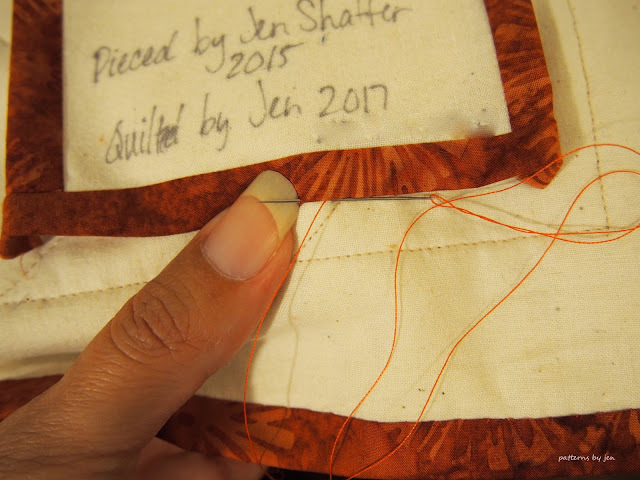 Now, because I was in a hurry I pinned just one side, stitched to the other, laid the second side layers together and stitched, only to find out I hadn't paid close enough attention to the sequence. Isn't that the way it goes? When you are in a hurry you will always end up taking out the seam ripper. You could always twist it in the middle to have the mitts work, but I wanted to make sure I gave him something nice, since he actually asked for it. See the opening where you pull it all through right side out? I always back stitch each side, that way if I have to put it all back, and then pull it right side out again, the stitching stays. I can guarantee that works, because I always have to go back and fix something. Top stitched and ready to use. They turned out great, mistakes and all, and he loved the gift. I will definitely be making this one again, but I will be making it a bit wider and the mitt part a bit longer to fit "man sized" hands. Fun Fact in Minnesota the casserole is known as a hot dish. What do you call it? 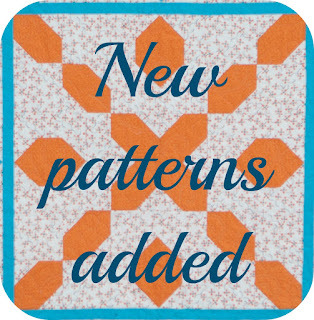 I am excited to add two digital patterns to my Etsy shop. The first is Criss Crossing. This pattern is for a 78" x 103" quilt top. 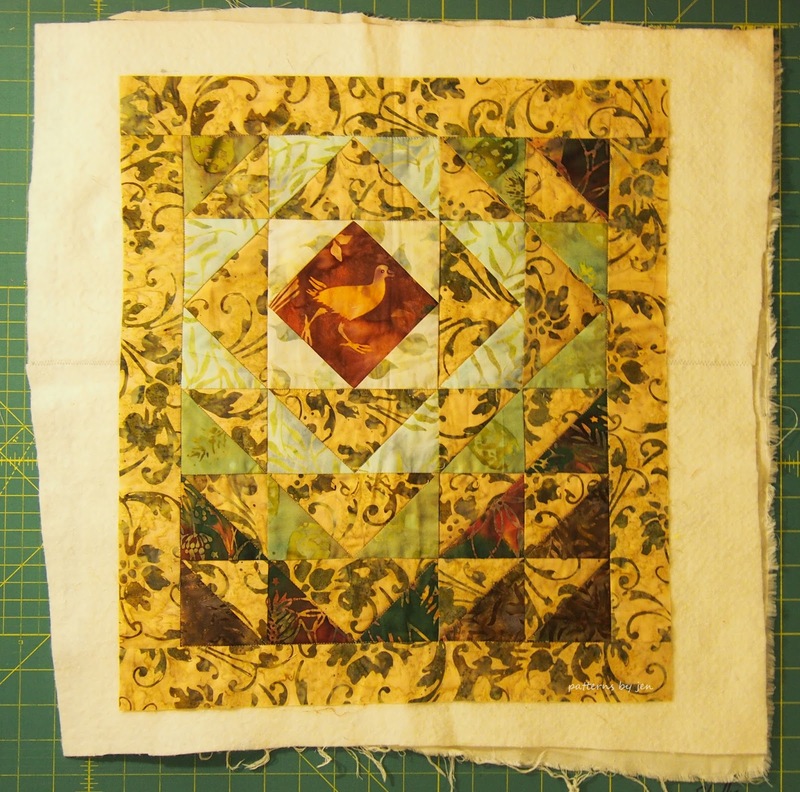 Using a large block this quilt is quick to build. 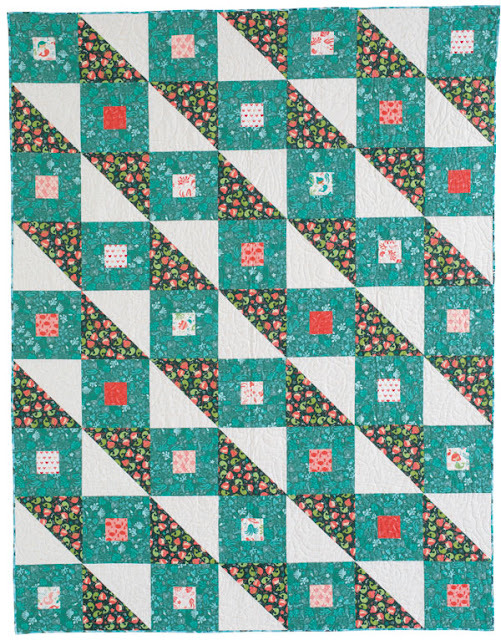 It is perfect for the college dorm beds as there is a little extra length from the large blocks. You can also choose to make just one block and turn it into a pillow instead. This quilt is for the advance beginner as accurate seam allowances are important. Find Criss Crossing on Etsy. 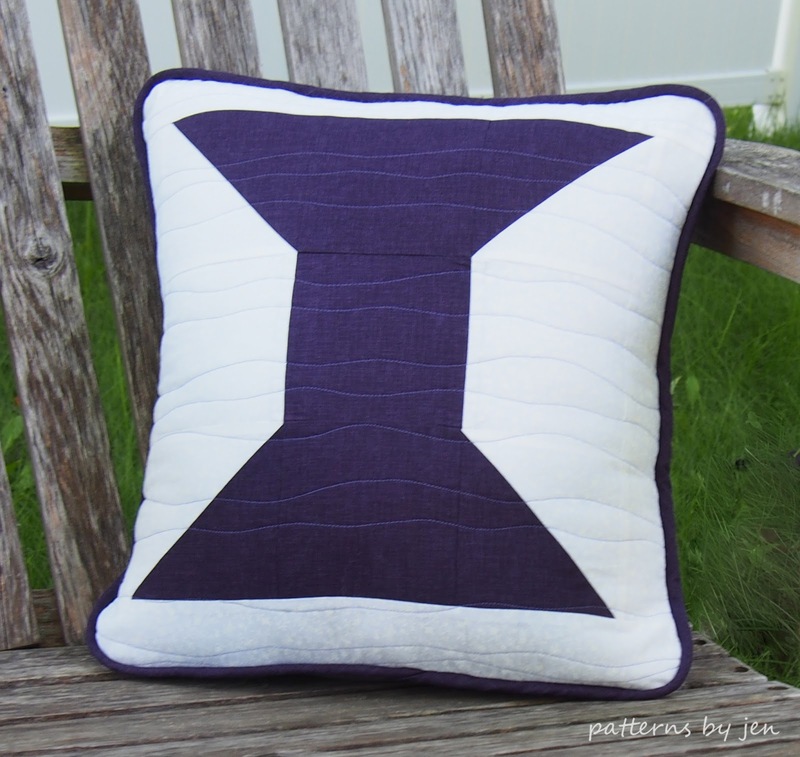 Find Criss Crossing on Craftsy. 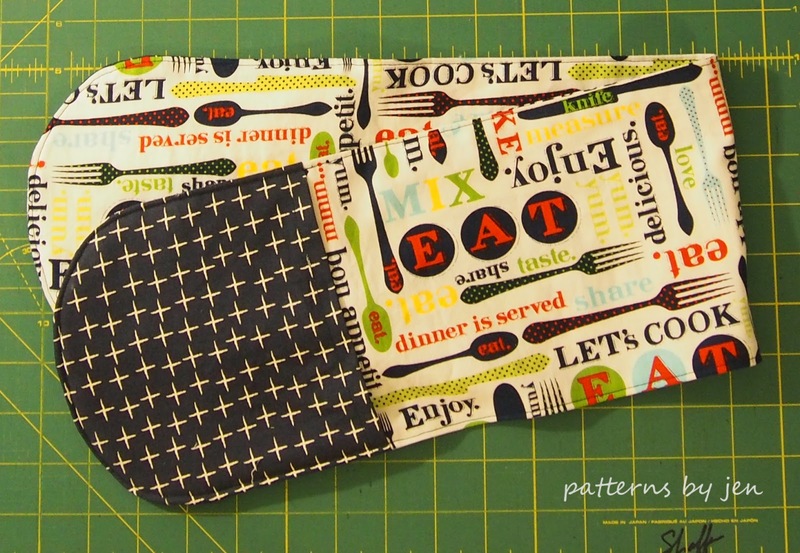 The second pattern is Quilt Crush. 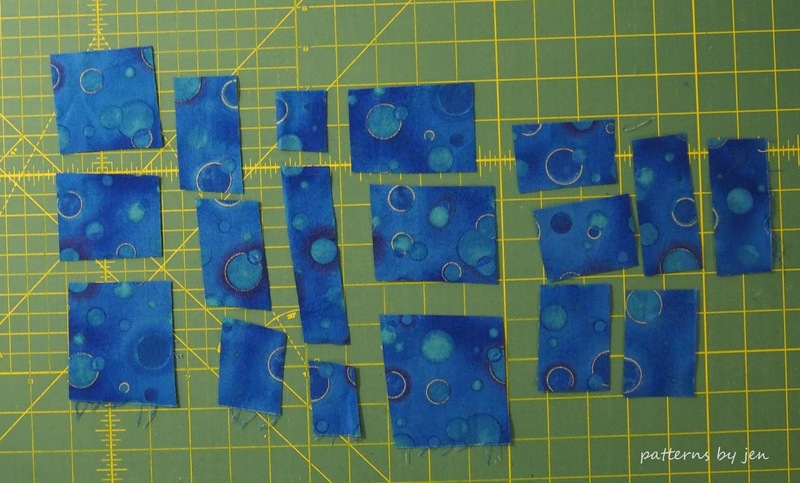 This pattern is for a 63" x 81" quilt top. The blocks are large enough to showcase some of your beautiful fabric finishing at 9" square. 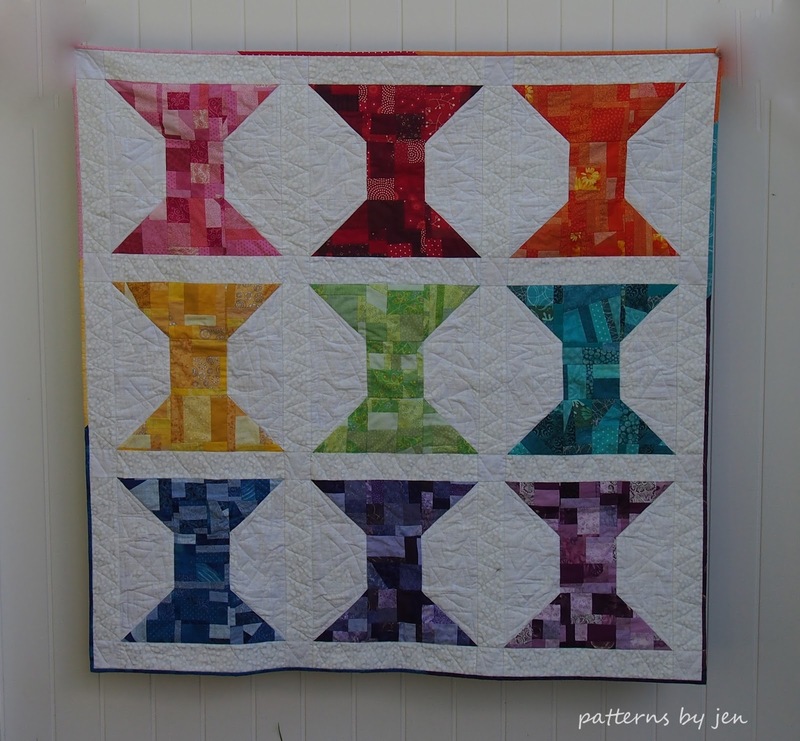 This quilt is perfect for a beginner. 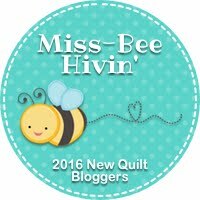 Find Quilt Crush on Etsy. 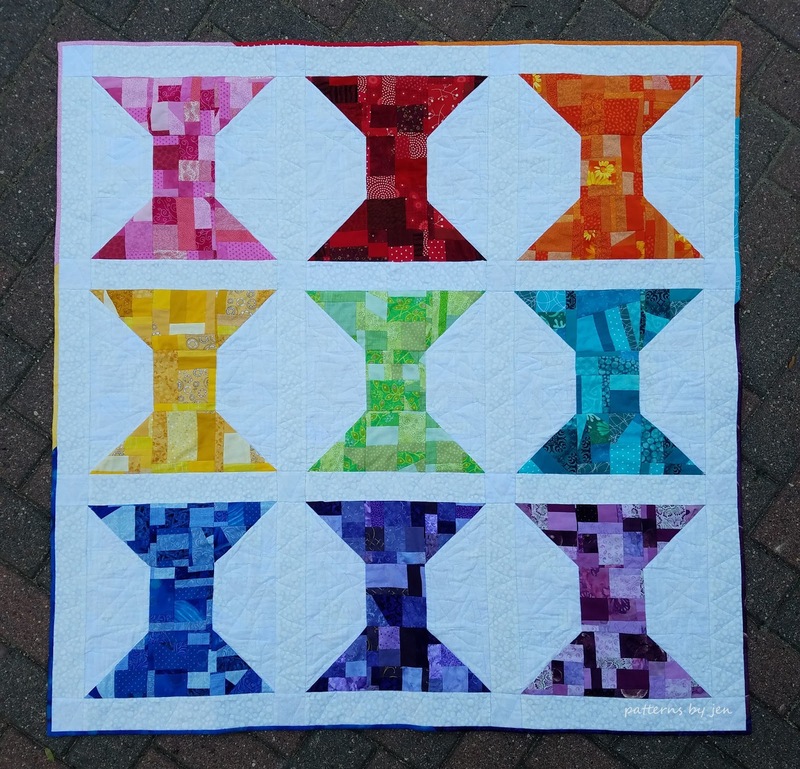 Find Quilt Crush on Craftsy. Follow me on Instagram and Facebook for daily peeks at my work. Welcome to the last Beginners Unite! We're talking labels. As with everything in quilting, there is more than one way to add a label. Have I said that before? 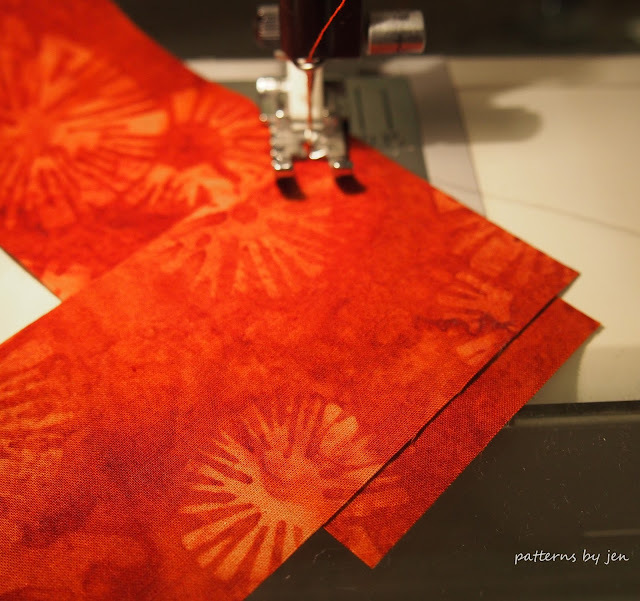 ;) There really isn't one way to do anything in the quilting world, you will enjoy it more if you do it your way. 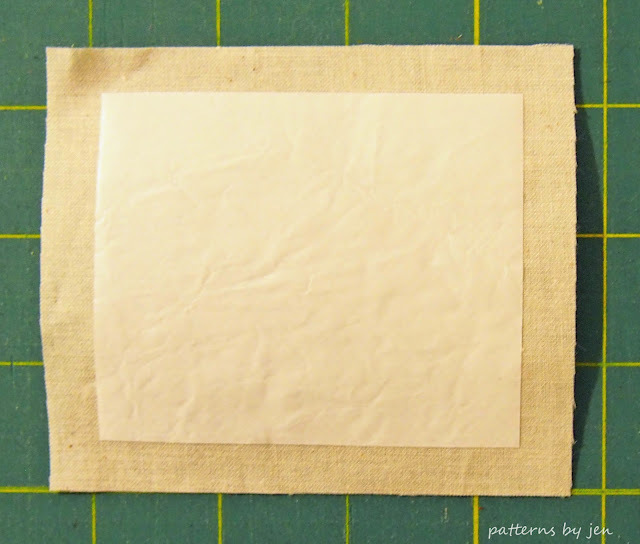 For this particular label I used a 4" x 3 1/2" muslin rectangle. I cut my heat n bond at 3 1/4" x 2 3/4". 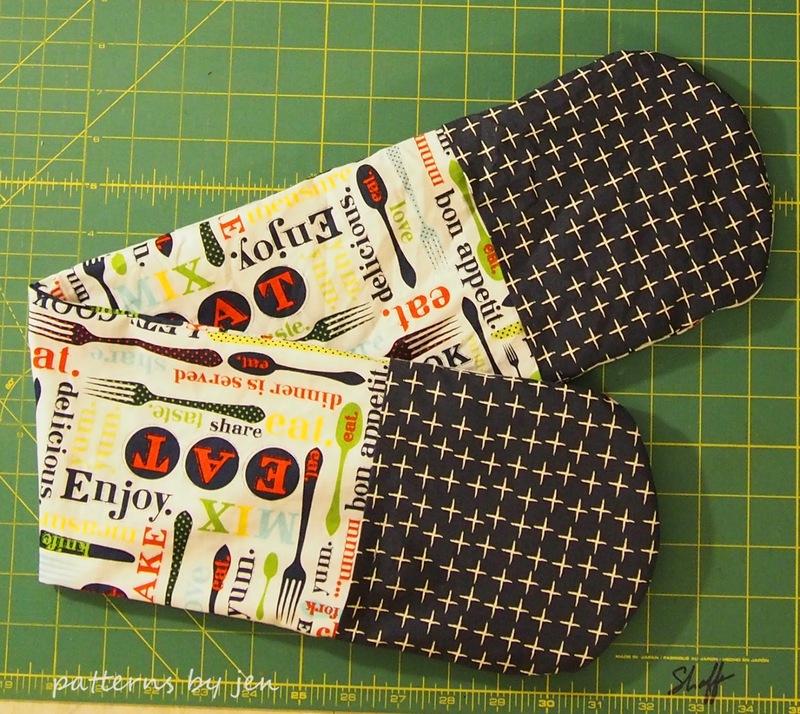 This gives me a 1/4" seam allowance all the way around plus a little extra. Leave the paper on the heat n bond for now, this helps stabilize the fabric when you are writing. 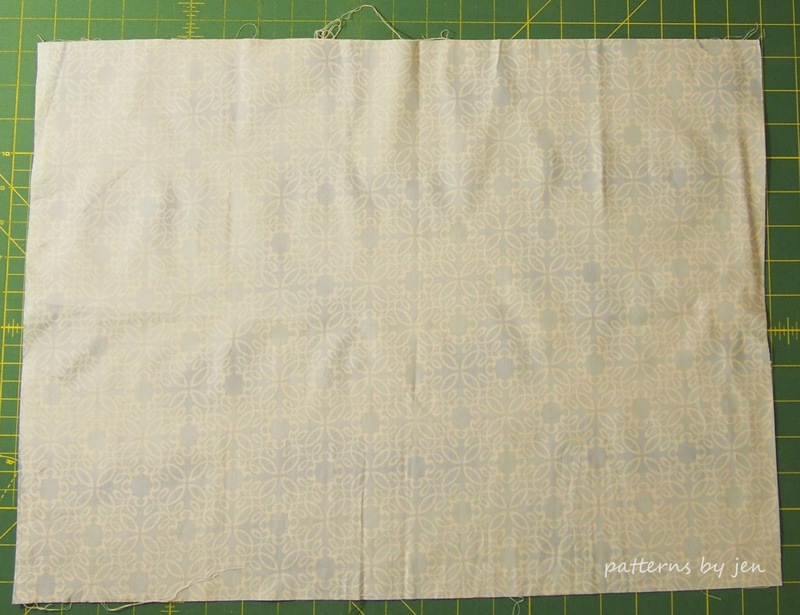 I write on the muslin before stitching my "border" pieces on, of course I forgot to take a picture of that. 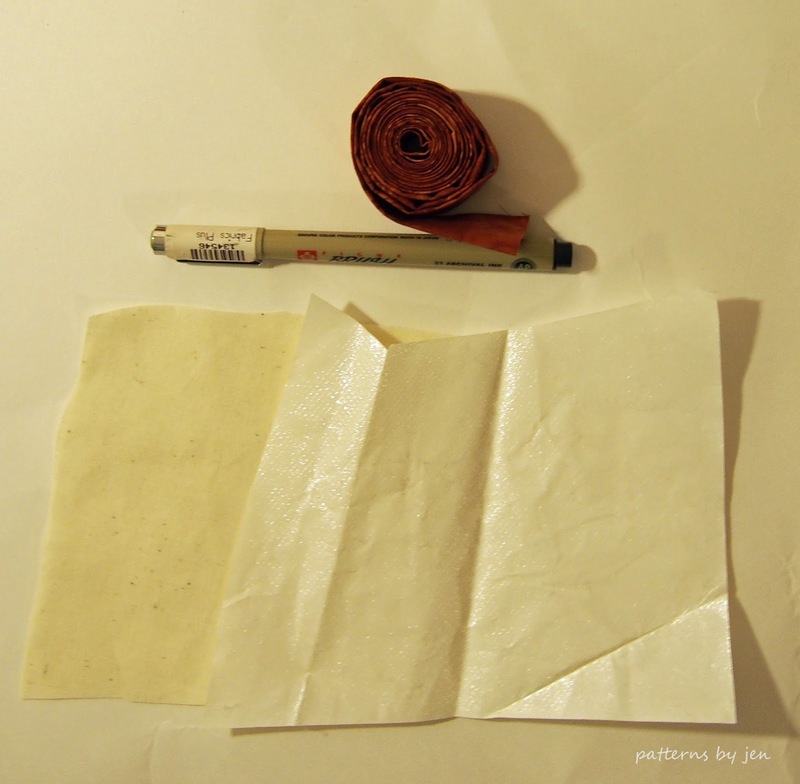 I will also stick a piece of lined paper behind the fabric to give me nice straight lines to follow when writing. I like to write the name of the pattern, who it's designed by (still trying to find that info for this one, the perils of not finishing something for 2 years), who it's for, then my name and phone number. On the quilts I mail to my photographer I write directly on the back of the quilt with permanent pigma; name of the quilt, Patterns by Jen, my name, address and phone number. 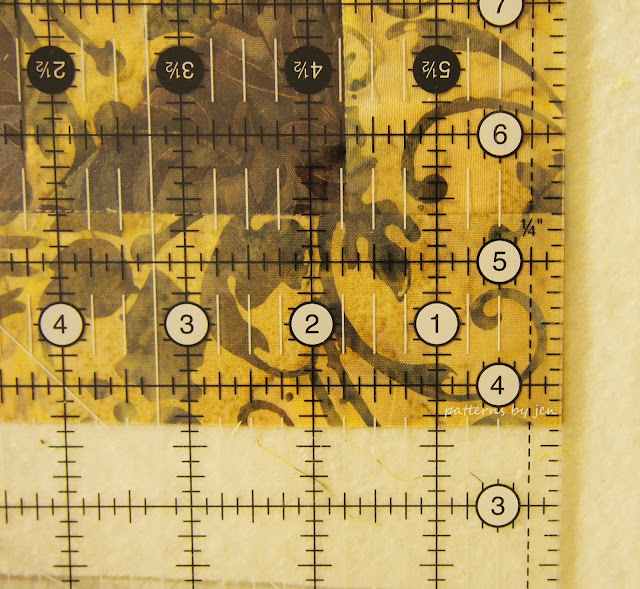 Once I have written down the pertinent information I will attach the borders, pressing out towards the borders. When the label is written, the borders are on, then I will remove the paper from the heat n bond and attach it to the back of the quilt. I like the back right hand side. I don't know why, it just feels right. I fold over the border until I can feel the seam allowance in the fold. 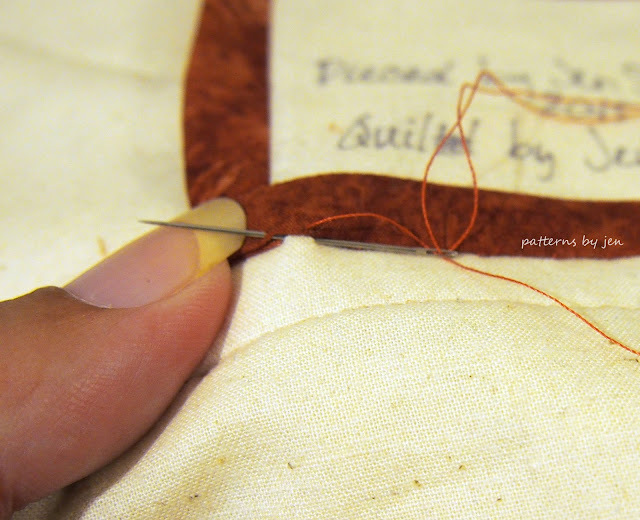 I start stitching the label the exact same way I start the binding. I also stitch 1/4" stitches. 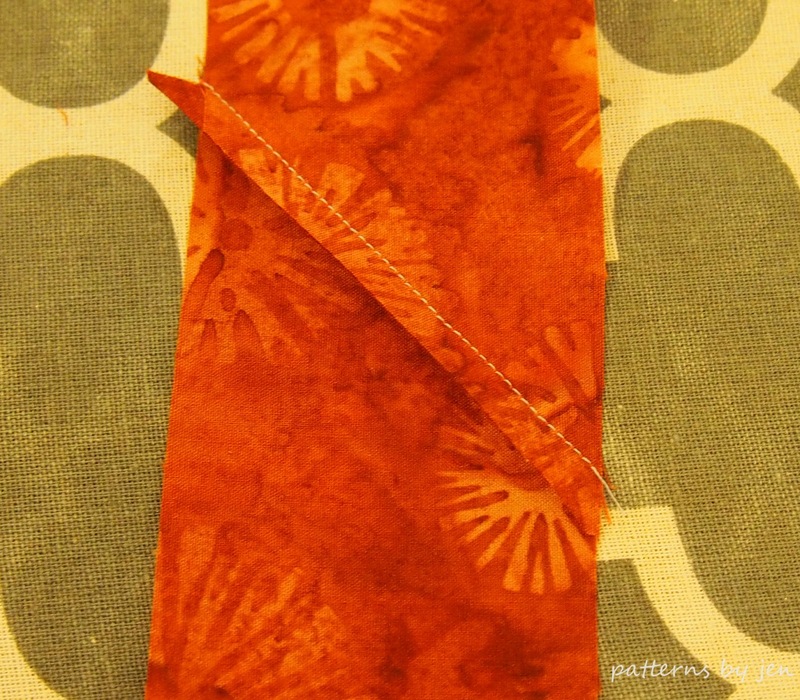 When I get to the corners where the border is folded I make sure to stitch just the border, not the fabric folded under. This keeps that fold under the border and not peeking out the sides.When I get to the end I knot off the same way I do the binding. Now you have a nice labeled quilt or wall hanging. 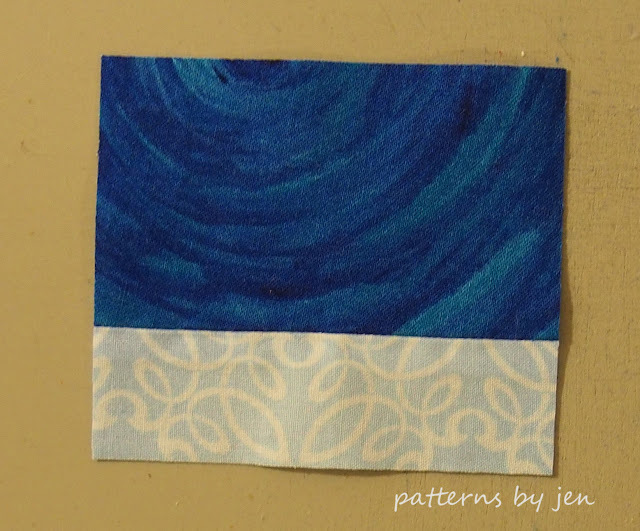 If you want to add a hanging sleeve to your wall hanging I have a tutorial HERE. I hope you have enjoyed the Beginners Unite series! Next Tuesday I will go over fabric amounts for the Beginners Unite Quilt Along! I hope you will join me. It's time for the binding! 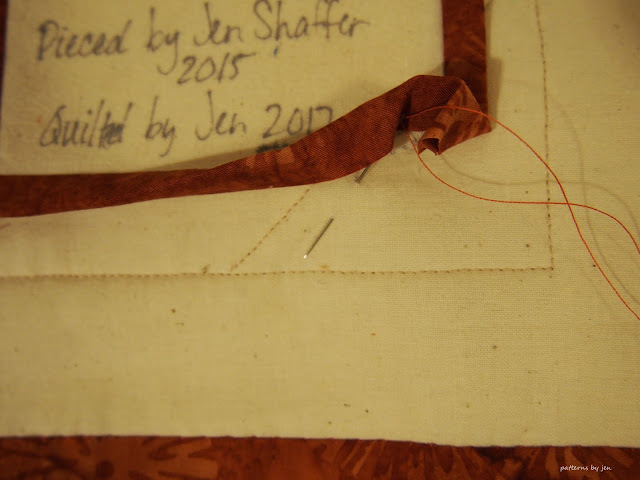 I love hand stitching the binding. It's my favorite part. I love sitting and stitching down the binding. Here is how I do my binding. First we need to square our quilt. While I am showing you on a wall hanging, I do the same thing for any size quilt I am putting binding on. It is important to have square corners and straight borders. Find a place to measure from. With this wall hanging, it's easy, I'm just going to use the border for my measurement. Here I'm using 1 3/4" as my mark. I use this same measurement all away around. When marking the cutting line, I also make sure the cut I made before is straight as well. Once the quilt is squared measure your sides and add them all together. For this one it is 13" x 18". Once I have this number I'm going to divide it by the width of fabric (WOF). I always use 40" as my go to. This is how many strips I need to cut for my binding. I take that number and multiply it times the width that I cut my strips. I cut my binding strips at 2" wide. 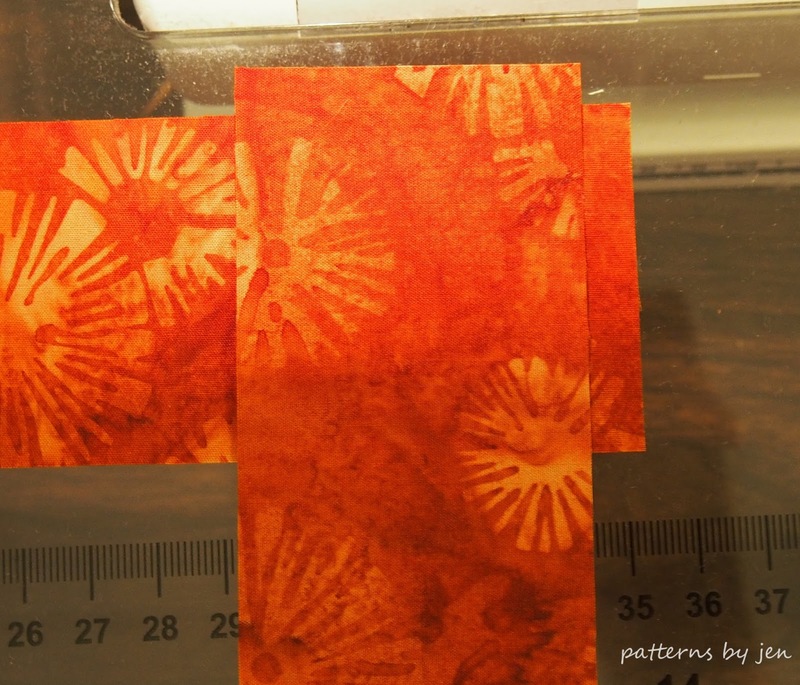 Since I will be cutting two strips I multiply 2 x 2 and know I need 4" x WOF. Find information for Accurate Cutting here. 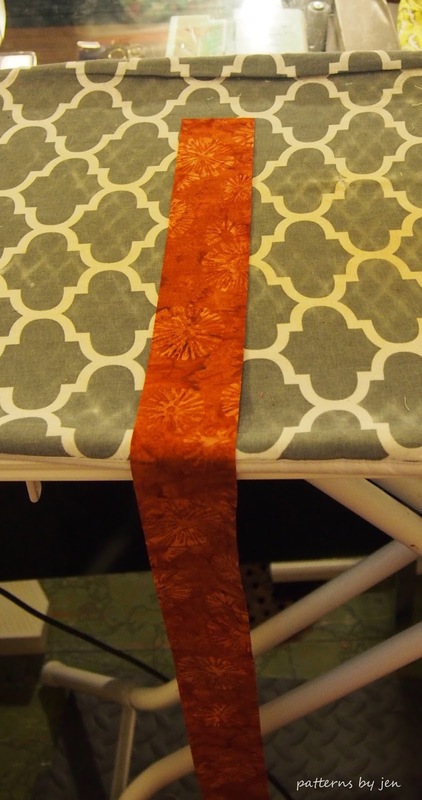 Place your binding strips right sides together (RST) as shown. Leave 1/4" edge of both strips over the end. Stitch from one corner to the other. Now press the binding in half. Years ago I read in a magazine (I don't remember which one) that it's better to press the binding with it hanging over like this, and not have it stretched out along the length of the ironing board. Something about stretching and pulling. Press the seams to one side, not open. Ilike to roll my binding up, it's easy to keep from getting bunched up and knotted. You can also put it in a bag and have it come out slowly. Side note: it's important to know how to get the correct amount for your binding or you will end up with a baggie like the one pictured. That is a sandwich sized bag filled with a long strip of binding. That binding is leftover from the first TWO twin size quilts I ever made. Yes, that is how much extra I made. It was funny then, and still funny now! 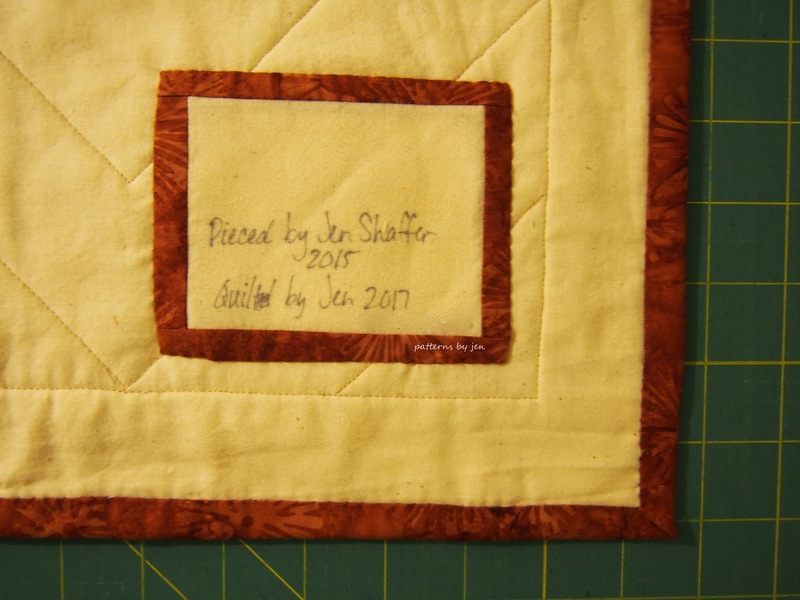 I hope you have funny quilting stories to tell, but hopefully, not binding if I've done this right! I leave about 6" when starting to attach the binding. Here is a video to help show how I do the binding. I believe it's easier to watch than to try and do pictures. Here is Part 2 of the Binding Tutorial, because YouTube editor wouldn't let me go over 15 minutes. Since I have limited knowledge of video editing, and my family was headed out the door for a family day at the time of this upload, it stays in two segments until I can come back and figure it out. Thank you for understanding! 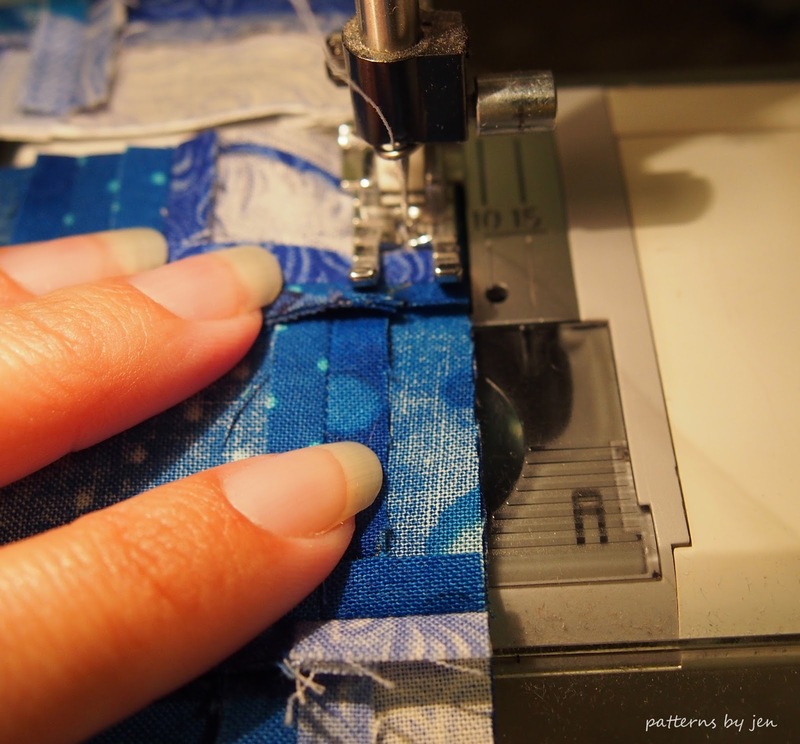 Do you hand stitch or machine stitch your binding? Let me know in the comments! While this was the last planned post for Beginners Unite, I'm going to add one more to the list. Next week Tuesday I'll show how I put on my labels. Don't forget we are going to have a Beginners Unite Quilt Along beginning the first Tuesday of September. More information in the next couple of weeks, but you can check out the quilt we'll be making here: Here a Square, There a Square. It is currently a free lap sized quilt pattern. 15) Binding - You are here!